The dining area doubles as a tea room and work space, clothed by a natural fiber rug and accompanied by an easy desk and chair. Grand curtains reach from the ceiling to floor, draping perpendicular to the stone wall and relaxing the overall look. Technology isn’t abandoned in the name of escape as a home theatre features well in this home, incorporating matching modest greys and straight lines for comfort for the body, mind, and eyes. The bedrooms a peaceful retreat with calm, cool tones and lighting. The natural and organic concept continues still, seen in the wooden headboard, night tables, and linen drapes. 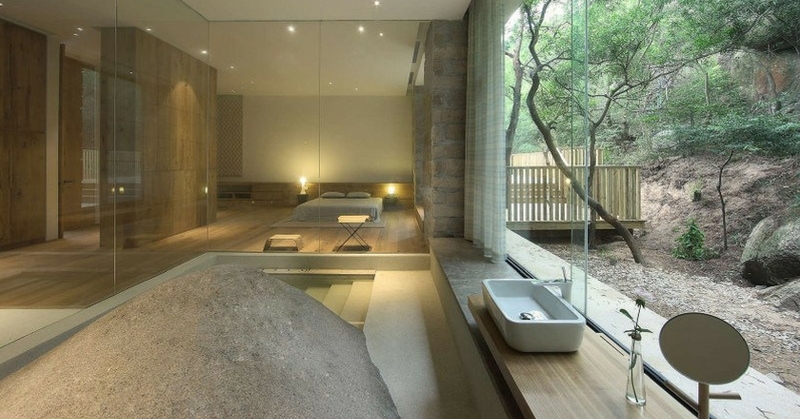 A large stone rock sits untouched outside the window, providing privacy and safety for a view. The same memorable stone wall extends upstairs to a large, wooden bar area, on the right of the landing that also acts as storage space. Bowled sinks sit atop stone counters that rest on wooden cabinets that also serve as organizational tools; providing clean functionality as needed in a smart bathroom. The shower is right beside it. Another bathroom exists as a see-through ensuite, uniquely walled by glass and containing a step-down bath. An unassuming wall that separates the master bedroom from the second bedroom cleverly doubles as a wardrobe, in line with the secluded and private theme strongly prevalent throughout this wonderfully organic and rejuvenating retreat into pure nature.